Franck Kom is the star midfielder of Panthère Sportive, currently fourth in the Cameroonian MTN Elite One. 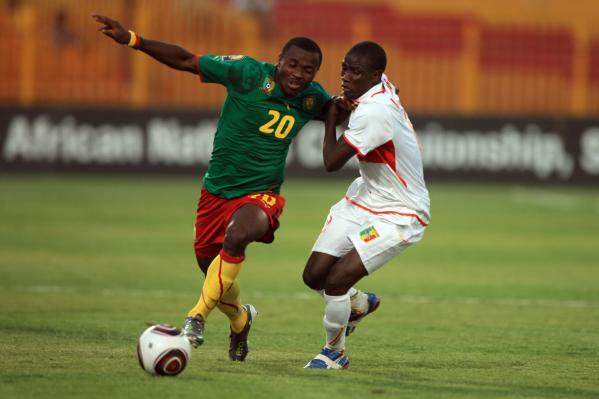 Kom is also a key player for the Cameroon U-20 national football team and was part of the Cameroon B national football team for the Orange African Champions Tournament (CHAN) that was played in Sudan in February 2011. Kom started the first two matches for his team, receiving yellow cards in both, which meant that he lost his place through suspension. Kom has been playing regularly for Panthère Sportive since the 2008-2009 season, in which he scored three league goals. Unfortunately, I have not complete goalscoring records for the 2009-2010 season, but I know that Kom was a key player all season. Kom has not scored yet during the current campaign, but has played 7-9 of Panthère’s 12 matches in the 2010-2011 MTN Elite One. Franck Kom is born 18.09.1991 according to the official Cameroon B CHAN-squad published on Cafonline.com. I believe this to be correct, as it is the same date of birth that was published in Lebanese media before the Jeux de la Francophonie-tournament that was played in Beirut, Lebanon in 2009. The tournament was for U-20 players. This article is interesting as it describes a couple of players that were “knocking on the door of the Cameroon national football team”. The players had been invited by Paul Le Guen, who was managing the Cameroon national football team at the time, for training sessions. Three of the players invited, Vincent Aboubakar, Patrick Mevoungou and Olivier Mabouka Massoudi have joined good European clubs since the sessions; Valenciennes FC(France), SK Sturm Graz(Austria) and MSK Zilina(Slovakia) respectively. Kom is a defensive midfielder but is also comfortable in defence. He is known for his excellent individual technique and his ability to recover the ball. He is very energetic, combative and makes precise deliveries. Franck Kom has been an important member of both Cameroon B and Cameroon U-20 during the last couple of years. He starred for Cameroon B during the Coupe de la CEMAC 2010 and is widely considered as one of the best defensive midfielders in Cameroon. Cameroon U-20 is one of the qualified teams for the Orange CAN-20 that will be played in Libya later this season. My guess is that Franck Kom will be one of the stars of the tournament. The picture is taken from Eurosport. Franck Kom is the player in the green shirt.